Death is one of those unpleasant certainties in life. With credit card debt, you may have additional anxiety about how debts are handled: Is your family responsible for repaying debt, or are those loans forgiven automatically when somebody dies? The simplest answer is that credit card debt is the borrower’s responsibility—not anybody else’s—especially when borrowing individually. But real-life situations are more complicated. What’s more, lenders can cause confusion and panic when they tell friends and family to use their own money to pay off somebody else’s debts. Your estate is everything that you own when you die, such as money in bank accounts, real estate, and other assets. After death, your estate will be settled, meaning anybody you owe has the right to get paid from your estate, and then any remaining assets will be transferred to your heirs. 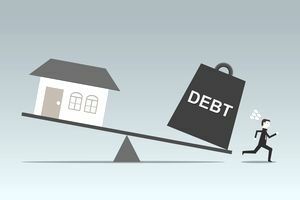 Lenders have a limited amount of time to collect on debts. Your personal representative (or executor) should notify creditors of your passing. It can happen through a published announcement and through communication sent directly to lenders. Then, debts are settled until all debts are satisfied, or your estate runs out of money. Not Enough Assets? If your estate does not have enough assets to cover all of your debts, lenders are out of luck. For example, if you have $10,000 in debt and your only asset is $2,000 in the bank, your lenders will write off any unpaid balance and take a loss. Property Can Be Sold: Your estate includes things like your home, vehicles, jewelry, and more. Any assets that go to your estate are available to satisfy your creditors. Before distributing assets to heirs (whether following instructions in a will or following state law), your personal representative is supposed to ensure that all creditor claims have been handled. If there’s not enough cash available to pay off bills, the estate may need to sell something to generate cash. Is the House Fair Game? It’s possible that an estate will have to sell the home to pay credit card bills and other debts. However, state law determines what actions are available to creditors. In many cases, local courts decide if the estate needs to sell a home or if liens can be placed on the home. Do the Heirs Pay? The estate pays off debt before a property is passed on to heirs. It can be confusing if somebody expects to inherit a particular asset—the asset has not yet changed hands, and it might never go to the intended recipient if it needs to be sold. Unfortunately, for heirs, it feels like they’re paying off the debt, but technically the estate pays. Only property in the estate is available for paying off debt. Assets can, and often do, pass to heirs without going through probate or becoming part of the estate. Not Available to Creditors: When assets skip probate, they are not required to be used to pay off debts. Creditors generally cannot go after assets that go directly to heirs, although there are some exceptions. Designated Beneficiary: Certain types of assets have a designated beneficiary or specific instructions on how to handle assets after the account owner’s death. A beneficiary is a person or entity chosen by the owner to receive assets at death. For example, retirement accounts (like an IRA or 401k) and life insurance policies offer the option to use beneficiaries. With a proper beneficiary designation, assets can pass directly to the beneficiary without going through probate. The beneficiary designation overrides any instructions in a will (the will doesn’t matter because the will only applies to assets that are part of the estate, and beneficiary designations allow you to bypass the estate entirely). Joint Tenancy: One of the most common ways that assets avoid probate is a joint tenancy with rights of survivorship. For example, a couple might own an account as joint tenants. When one of them dies, the surviving owner immediately becomes the new 100 percent owner. There are pros and cons to this approach, so evaluate all of the options with an attorney—don’t just do it to avoid paying off debts. Other Options: There are several other ways to keep assets from going through probate (including trusts and other arrangements). Speak with a local estate planning attorney to find out about your options. In some cases, a surviving spouse may have to pay off debts that a deceased spouse took on—even if the surviving spouse never signed a loan agreement or even knew that the debt existed. In community property states, spousal finances are merged, and this can sometimes be problematic. Community property states include Arizona, California, Idaho, Louisiana, Nevada, New Mexico, Texas, Washington, and Wisconsin. Alaska residents can choose community property treatment as well. Check with a local attorney if you’re faced with paying a deceased spouse’s bills. Even in community property states, there are opportunities to have some debts wiped out. In some cases, relatives and friends are required to pay off debts for a borrower who has died. It is often the case when multiple borrowers are on an account. Joint Accounts: Are accounts opened by more than one borrower. It is most common with married couples, but it can happen in any partnership (including business-related partnerships). In most cases, each borrower is 100 percent responsible for the debt on a credit card. It doesn’t matter if you never used the card or if you share expenses 50/50. Cosigning: Is a generous act because it’s risky. A cosigner applies for credit with somebody else, and the cosigner’s good credit score and strong income help the borrower get approved. However, cosigners don’t get to borrow—all they do is guarantee that the loan will get repaid. If you cosign and the borrower dies, you’re generally required to repay debt. There might be a few exceptions (for example, the death of a student loan borrower might trigger a discharge—or other complications), but cosigners should always be willing and able to repay a loan. Authorized Users? Additional cardholders are typically not required to pay off credit card debt when the primary borrower dies. These individuals were simply allowed to use the card, but they don’t have a formal agreement with the credit card issuer. As a result, the credit card issuer typically cannot take legal action against an authorized user or damage the user’s credit. That said, if you’re an authorized user and you want to take over the card (or card number) after the primary borrower dies, you can often do so. You’ll need to apply with the card issuer and get approved based on your own credit scores and income. Defrauding Lenders Is an Exception to Everything Above: For example, if it’s obvious that death is imminent and the deceased will not have any assets to repay bills, it may be tempting to go on a shopping spree (or make cash withdrawals) as an authorized user. If the courts decide that this was unethical, an authorized user might have to pay off the debt. Handling debts after a death can be confusing. In addition to the emotional stress and the endless tasks that need attention, you’ve got a confusing set of debt collection rules to contend with. Collectors Can Often Call Family and Friends of a Deceased Borrower: The rules vary from state to state. Lenders are not supposed to mislead anybody who’s not required to repay a debt. The law only allows this type of contact to enable lenders to get in touch with the person handling the deceased’s estate (the personal representative or executor). Don’t Get Tangled up in Collection Efforts: Request that all communication come in writing, and avoid providing any personal information (especially your Social Security Number) to debt collectors. If collectors come to your house, you can ask them to stop. Collectors Sometimes Mislead Loved Ones: Making them think that they need to repay the debt. Most debt collectors are honest, but there are certainly some bad apples out there. If you’re not responsible for a debt, refer lenders and debt collectors to the personal representative handling the estate. With persistent collectors, request—in writing—that they stop contacting you. If Assets Pass to You, Those Assets Are Probably Not Fair Game for Collectors: Assuming the personal representative and financial institutions handled things properly, your inherited assets should be beyond the reach of creditors. However, check with an attorney when in doubt. Get Legal Help If Somebody Asks You to Pay off Credit Card Debt for Somebody Who Has Died: Collectors are often confused and eager to simply collect. Sometimes they’re even dishonest. Don’t assume that you’re liable just because somebody says you are. If you have credit card debt, it’s wise to plan ahead—you can make things easier on everybody at the time of your death. Estate Planning: Is the process of planning for death, and it’s a good idea for everybody (rich or poor). During that process, you’ll cover important topics such as your will, medical directives, final wishes, and more. It’s also possible to get more complex and use trusts to manage assets after you pass away. Life Insurance Can Help Pay off Debt When You Die: Especially if somebody else will be responsible for your debt, life insurance protects your loved ones. It can be used for any purpose, including paying off credit card debt or home loans (including home equity loans). Simplify Your Finances Before You Die: Things will be much easier for your executor. If you have numerous unused accounts open, consider closing them (but beware any consequences to your credit). Loans scattered around can potentially be consolidated into one place, and you might even save money on interest. Watch Your Beneficiaries and Joint Account Holders: When assets pass to a designated beneficiary, they can bypass probate, and they’re not available to creditors. The same may hold true for a joint account with rights of survivorship. However, if you have no living beneficiaries, the assets may wind up going to your estate (check with your retirement account custodian and life insurance company to find out what their rules are—it varies from company to company). Once assets are in your estate, they may have to go towards paying down debt. Review your beneficiary designations periodically to make sure they still make sense. If you’re the executor of an estate (or the personal representative or administrator, depending on the situation), it’s important to handle a deceased borrower’s debts correctly. Get Extra Death Certificates: You’ll need to provide notice to numerous organizations. Requirements for a “copy” of the death certificate will vary, but it’s best to have official documents from your local Vital Statistics Department—get more than you think you’ll need. Notify Creditors That the Borrower Has Passed Away: Check with a local attorney to ensure that you’ve provided sufficient notice (you might not be aware of all creditors, so you’ll need a way to get the information out to unknown lenders). Notifying creditors also prevents somebody from racking up debt in the deceased person’s name. Notify the Social Security Administration of the Death as Well: It can help prevent identity theft and other complications, and it may be helpful for creditors. Get a Credit Report for the Deceased Individual: Use this to identify lenders that may need to be notified of the borrower’s death. Even if the borrower has a zero balance, notify all potential lenders—you don’t want a credit card (or credit card number) out there available to thieves. Work With an Attorney If You Have Any Doubts: The price you pay can help you avoid expensive and time-consuming mistakes. Get a Big Picture View of All Debts of the Deceased: If the estate does not have enough money to pay every creditor with a claim, you’ll have to prioritize debts—using state law as a guide for ordering the list. Wait until you know about all claims before you start making payments. Credit card debt is generally relatively low on the list (while taxes, final expenses, and child support take a higher priority). Don’t Distribute Assets to Heirs Until You’re 100 Percent Certain That Valid Creditor Claims Have Been Paid Off: Nobody wants to make heirs wait, but it’s essential to get all of the details correct. As an executor, you’re not responsible for paying the deceased’s debt out of your own funds, but you can be held personally liable if you make a mistake and fail to pay a valid claim. The type of debt you have matters. Again, there’s a priority to which debts get paid off (and how), and credit card debt is relatively low on the list. Personal Loans: Credit card debt is a form of personal loan, and most other personal loans are handled similarly. No collateral is required to secure the loan, so lenders have to hope that the estate will have sufficient assets to repay the debt. Student Loans: ​Student debt is also unsecured in most cases. However, these loans are sometimes discharged (or forgiven) at the death of the borrower. Especially with federal student loans, which are more consumer-friendly than private loans, there’s a good chance that the debt can be wiped out. Private lenders can set their own policies. Home Loans: When you buy a home with borrowed money, that loan is typically secured with a lien against the property. That debt needs to be paid off, or the lender can take the property through foreclosure, sell it, and take what they are owed. Second mortgages and home equity loans leave you in a similar position. Federal law makes it easier for certain family members and heirs to take over home loans and keep the family house, so don’t expect the lender to foreclose immediately. Auto Loans: Auto loans are also secured loans where the vehicle is used as collateral. If payments stop, the lender can repossess the car. However, most lenders simply want to get paid, and they won’t repossess if somebody takes over the payments. Get help if you’re not sure how to handle a situation—there’s nothing wrong with doing so. The deceased chose you based on your judgment, and you can decide that professional assistance is required (and the heirs will just have to deal with that). Settling an estate after death is a complex process. The emotional toll of losing a loved one only makes it harder. Professional help from local attorneys and accountants can guide you through the process and make sure things don’t get worse. What Happens to Your Mortgage When You Die? When Should you use Western Union for Payments?